The people who brought you The Braces Cookbook have done it again! Now, especially for adults with a discerning palate, there is The Braces Cookbook2: Comfort Food with a Gourmet Touch, by Pam Waterman and Chef Amee Hoge. The Braces Cookbook2 includes selections for every meal of the day, plus ideas for entertaining and a special section for Vegetarians. In addition to recipes, the book contains soothing tips for difficult days, suggestions for eating out, and coping techniques for business people. Both The Braces Cookbook and The Braces Cookbook2 are great gifts for yourself or a friend or loved one in braces! If you just got braces and are tired of eating yogurt, soup and mush, these books will go a long way to make you feel satisfied. The recipes are so good, everyone in your family will love them, whether they have braces or not! Contains 50 all-new gourmet recipes geared toward adults in braces. 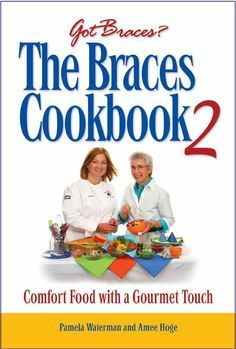 Both this cookbook, and its predecessor (The Braces Cookbook) are invaluable to people who are new in braces. On our ArchWired.com message board, one of the most frequently asked questions is: My mouth hurts! What can I eat?! This cookbook helps answer that question with ease. The author has taken great care to ensure that the recipes in both books are tested and delicious. This is a very thoughtful gift for someone in braces.